Marketing via A Cup Of Tea? This Entrepreneur Says, yes! Quirky advertising themes are really the talk of the season. Both startups and large corporate names are leaning towards innovative branding strategies. Here are two entrepreneurs, who have aimed to challenge digital media and print bandwagons via teacups. Founders Sidharth Singh and Sanil Jain, both of whom are engineering graduates, run CupShup, wherein they specialize in advertising over paper tea cups. The duo believe that tea, as a beverage, touches life of every Indian everyday and they aim to use this opportunity by branding the tea cups and tea stalls with exciting artwork and message that converts the tea stalls into discussion joints. The advertising medium is helping brands break the monotony of traditional advertising mediums and providing exposure time of 5-7 minutes, which is unheard in advertising industry. “While having a cup of tea with friends during my MBA days, we spent a lot of time (which we had in plenty) discussing a lot of things, ranging from movies, politics, sports and what not. It occurred to me that nothing connects Indians in the way tea does and thus if we come up with something that channelizes the discussion over tea, we will be able to make deep impression in a customer’s mind,” said Sidharth. 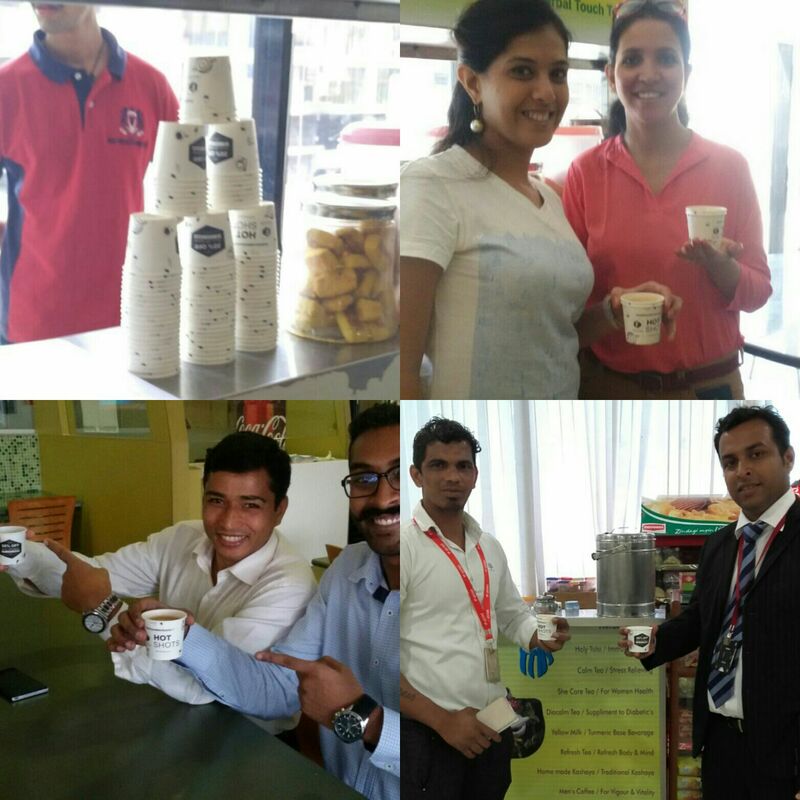 In his last trimester of MBA at NMIMS, Mumbai, Sidharth opted for a course in entrepreneurship and started working on the CupShup idea (Named it Cupvertising then). Since it was very difficult to get a small number of cups printed, he bought 100 cups, pasted stickers on them (Of a fabricated brand with an offer) and distributed it to the nearby Chai walas. He also designed some questions related to that creative and interviewed people after they finished the tea. “The result of product validation survey was fantastic. Almost all of the people I talked with, were able to recall the brand on the cup when aided (although fabricated one) and had a fair idea of the offer that was printed on the cups. Thus I established that this idea has the potential and brands will be attracted towards this idea for promotion,” Sidharth said. After completing his MBA, Sidharth shared his idea with Sanil Jain, who was then working for Amazon and was equally interested in this idea. And that is how they started their entrepreneurial journey. Cupshup’s clientele today includes more than 50 companies, which includes names like Uber, Ola Cabs, Swiggy, Kotak Securities, Viacom 18, Coke and many others. When someone thinks of advertising, digital, print and other platforms overpower such nascent ideas. But Sidharth knows exactly why CupShup will click with companies. “While advertising over TV, radio leaves an option to change the channel for customer, advertising over paper tea cups is bound to make an impression in customer’s mind. Our medium is clutter free, provides 5-7 minutes of exposure time and triggers discussion over tea breaks which make a deeper impression in customer’s mind,” he said. Among all the campaigns done by the company, Sidharth said that the most innovative one has to be the ones done for the biggest search engine companies of the world. Sidharth declined to name the company due to non-disclosure agreement with the client. “Client’s primary objective was to promote its voice search app download to the mobile handset of customers. We used a two pronged strategy for the campaign which was run for a period of 2 months. Interesting queries were printed on the cups which were related to significant events (Women’s day, IPL, ICC Champions league, Maharastra day etc). These cups were distributed at tea vendors strategically located at different parts of Mumbai,” he said. The company had posters that were pasted at these tea stalls which educated customers abouthow to search the queries printed on the cups by downloading the app and enabling the voice search functionality. “Users were intrigued by the queries printed on the cups and discussed it among themselves during tea break. Many of them downloaded the app and tried the voice searched functionality. The tea stalls were literally converted into discussion joints for the brand! !” Sidharth said. At a time when investors are becoming choosy about new investments, CupShup remains bootstrapped and is profitable, going strong in second year of its operations. However, the company is piloting channels, which are non-traditional and innovative and would need funding to scale them effectively. Cupshup has a distribution network of 2 Airlines, 1000 offices, 400+ Colleges and 3000+ Retail tea vendors across 8 Cities of India. The company has also categorized tea vendors on the basis of nearby point of interest, viz, IT park, manufacturing hub, college etc to target effectively.